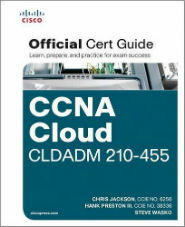 The Introducing Cisco Cloud Administration (CLDADM) course is designed to help students prepare for the CCNA Cloud certification. This course covers the basic features and operation of Cisco UCS Director (UCSD) and Cisco Intelligent Automation for Cloud (CIAC) products. It includes coverage of Cloud provisioning, management, monitoring, reporting, charge-back models, and remediation. What is included with the Introducing Cisco Cloud Administration Course?